Throughout the project there were a variety of failed attempts within the blogging community. In order to connect with bloggers I started to look at a few of my favorites that I tend to go to when in a cooking pickle. The posts on each site have always been so helpful I haven’t found my self needing to post a question or concern so I instead just said hello. This obviously did not work. Many of the blogs I commented on were well known and I am sure the number of “hello”s they receive is too many to bother with. After coming to this realization I started to cater to certain blogs that seemed to fall in line with the Slow Food ideals or who expressed themselves are more consciously aware of what they were eating. 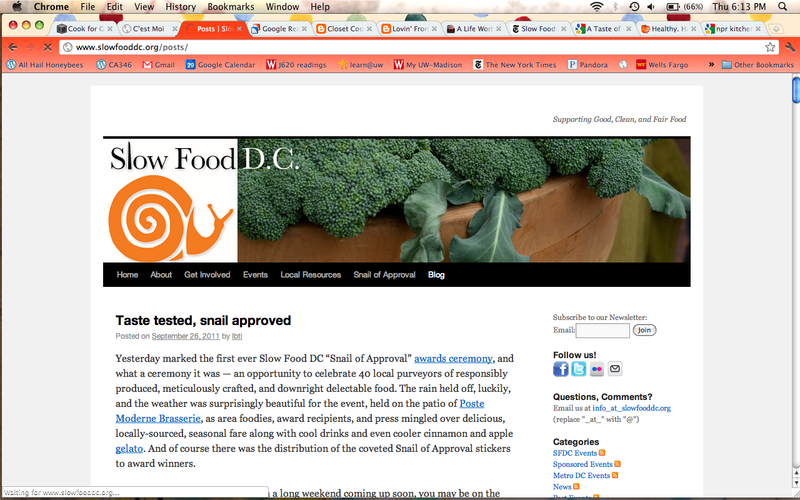 Here is where I discovered Sprout & Pea. Mardi Miskit is a former chef who enjoys cooking organic and gluten free. Her blog presents itself in a very earthy and free spirited way that initially allows me to think that she is not stocking her shelves with MSG and the like. 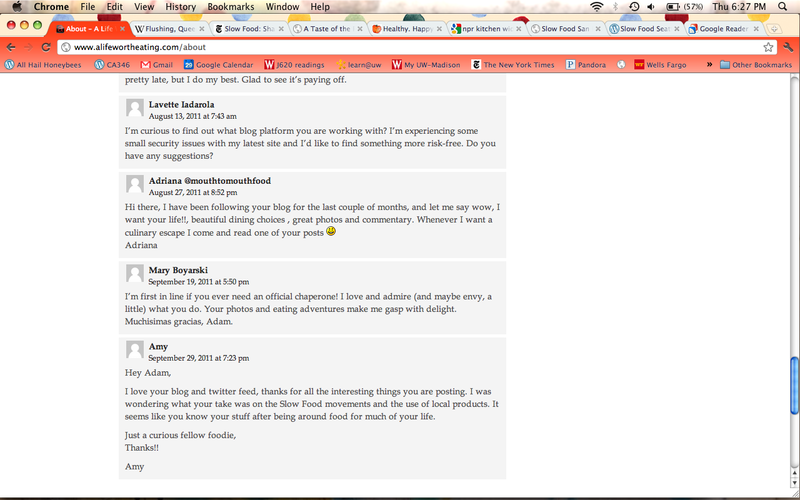 I decided to comment on her blog hoping to make a relationship but still to no avail I did not succeed. 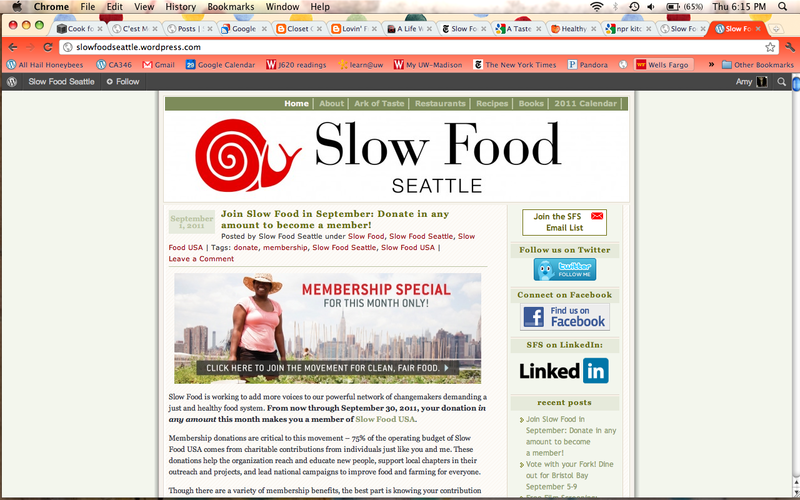 The image is one of her posts that came up in my reader that illustrates her knowledge of the Slow Food movement. 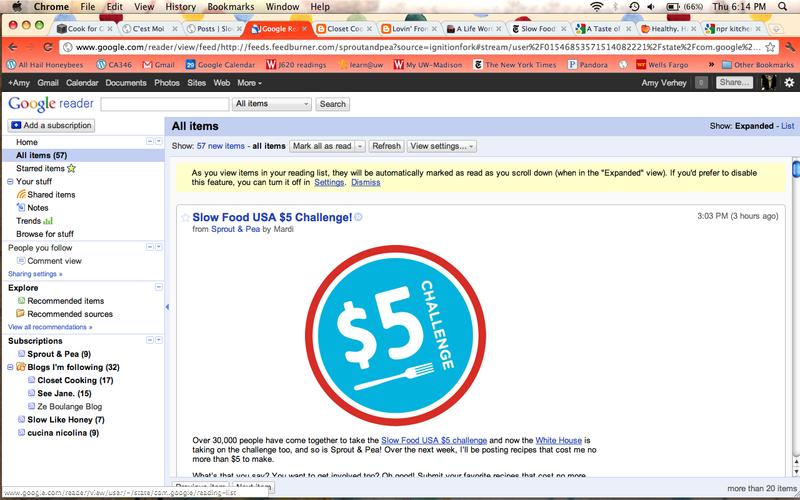 She promoted the 5$ challenge that Slow Food USA sent out and many other Slow Food chapters took part of. I continued to search blogs and comment away with only a handle actually making a connection. Another example is Adam Powell’s blog. He is a writer for the A.V. Club Madison section of the Onion and through my Twitter feed we have made a connection. 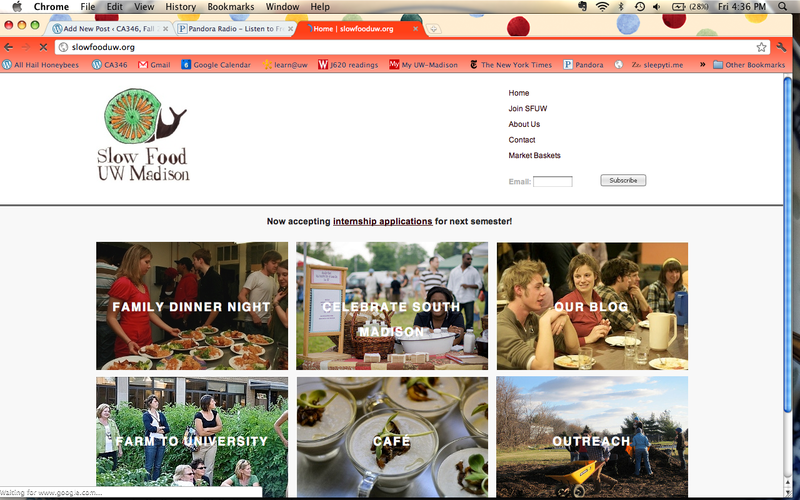 I often tweet about foodie issues or recipes as well as things going in and around Madison. He had picked up on this and responded with a direct message. I am not sure if this was solely due to my Twitter activity or a combination but Twitter wasn’t really an area of focus for my specific practicum project so I hesitate when bringing it up. 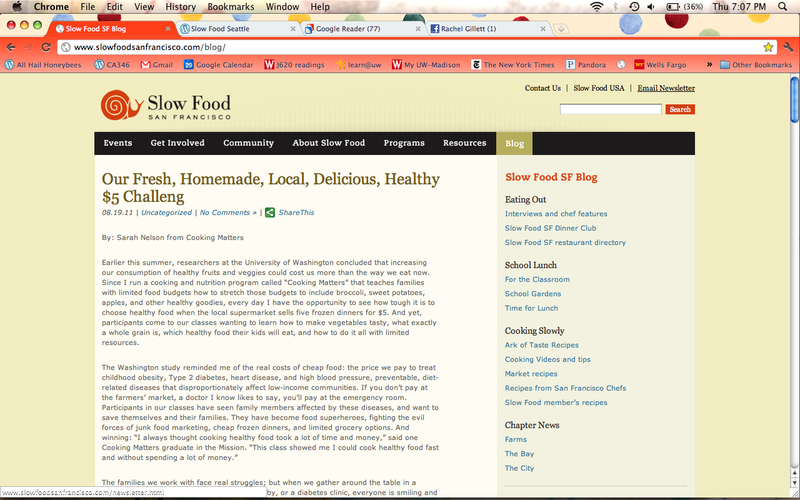 The final area of blogs I explored were the blog of Slow Food chapters. These were not crafted in the traditional blog format and seemed to appear more like a website but there were ways to post opinions or contact writers. I did such things and still found no response. I will and did keep trying to end up with a successful project that will grow beyond the class.